I have learned that if you first don’t succeed . . . . try, try again!! Yesterday Jennifer from A Passion for Nature and I decided to head up to Buffalo for another attempt at Short-eared Owl banding with State Biologist Chuck Rosenburg from the Department of Environmental Conservation. You might remember my last trip a few weeks ago with many great views and two “almost” catches!!! Although seeing these amazing birds flying around is fun . . . our primary mission was watching them being banded. The question is: will we catch something?? We both started on the Northern end waiting anxiously for any kind of bird activity. 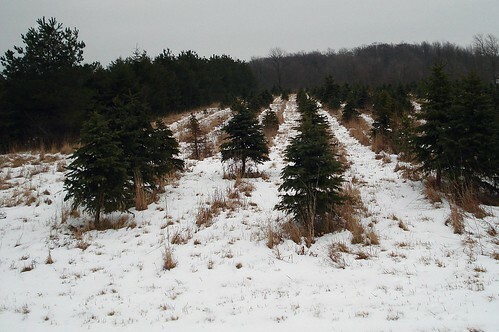 We enjoyed listening to a Great-horned Owls hooting in the background, a flock of Cedar Waxwings circling around us and a then a flock of Common Redpolls/American Goldfinch/Dark-eyed Juncos selecting their evening roost into the Christmas tree plantation. Suddenly we had a Short-eared Owl moving directly towards us . . . . closer and closer it came . . . quickly I handed my binocs over to Jen and went for my camera! I looked over my shoulder just as the Short-eared Owl dropped to the grass (almost right in front of Jen). Jen told me about it capturing a small critter before the Red-tailed Hawk decided to arrived. 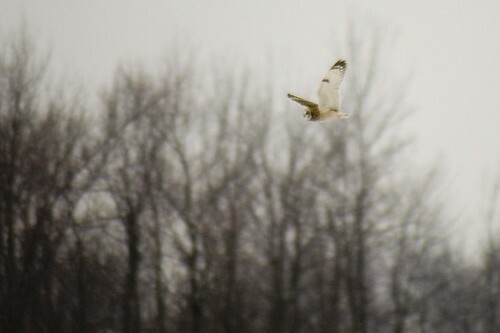 The Red-tailed Hawk took a few dives at the Short-eared Owl and then both birds moved in every which direction!! How many times do I need to say how amazing it is to watch these guys?? One of Jennifer’s photos of me eating! We had a little down time after this amazing sighting and decided to eat some dinner . . . . talked about blogging . . . . and then listened to the walkie-talkies regarding the birds on the Southern end (all while we were drastically searching for any movement). It appears that the Red-tailed Hawks had also made an appearance in the Southern end which kept the birds from hunting (in both areas)! Lucky we had Sherry (another volunteer) to find some owls roosting in the tree and spooked 3 short-eared owls into flight. This is when things started to get exciting . . . Jen yelled “a bird is flying out in the field“! We both were trying to get the night vision working (it was dark and the raining was coming down as hard as it possibly could). Sherry reports over the walkie-talkie that one of the traps have been triggered (“the light is on”)!! We all jump out of the vehicles and start running into the field. Sure enough we had a Short-eared Owl and we safely threw a towel over it! As Jen states “our adrenaline started flowing” and we just realized that we not only had one but another one was also in the BC trap. Everything became a blurr at this point and probably was more confusing with the Southern team because they were also focusing on a bird moving towards there traps (we almost had a hat trick). We got both of the Northern birds out of the trap and would have worked faster if I didn’t get myself tangled. Once the Southern team arrived to the site they said “you have two??”! 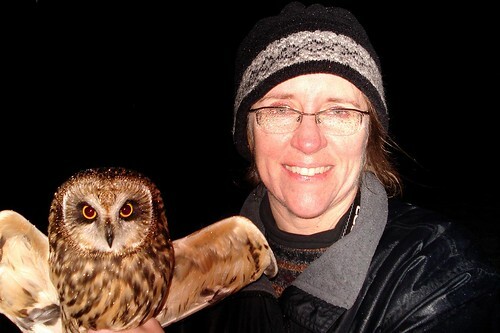 Myself holding the second Short-eared Owl! This was such a perfect evening with these most beautiful owls! I would like to thank Chuck and his entire team for allowing us to join him in banding these owls. Then to Jennifer for putting up with me on the long drive up to the banding site. 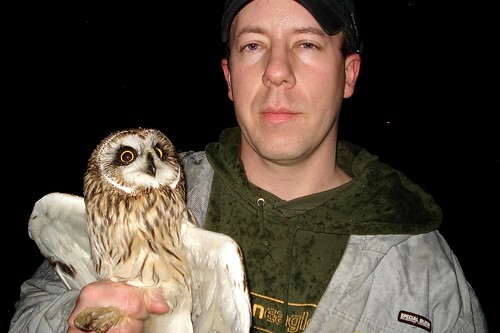 Next post [part 2] will be about the banding process, the transmitter and releasing the owls. This entry was posted on 10 February 2008 by mon@rch. It was filed under Bird Banding, Birds, Flickr, Nature, Owls, photography and was tagged with "Short-eared Owl" Research. Yeah, that’s pretty much how I remember it, too! you have some really beautiful photography here! That must have been such a BLAST!! I looked at your flickr pix and they’re fabulous. What a gorgeous bird. Wow Tom, what an awesome time you must have had, and what beautiful birds! @ Jen – LOL, wasn’t it fun!! Thanks! @ Allison – thanks and we all need to be active in our own ways! @ Lynne – You have no idea how much fun it was! Well, besides the freezing rain and freezing cold winds! @ Tom – it sure was and wait till you see tomorrows pictures! Quite an evening! I’ve only ever seen one SEOW, and it was very distant! Cute buggers (of course I say that about any owl). A REAL ADRENALINE RUSH, FOR SURE! Wow. I’m happy for Jennifer’s success in such bad weather. What a wonderful day, rain and all. Can’t wait to see the banding. Owls are beautiful. Very cool Tom! Glad your trip was a great success!! How exciting. 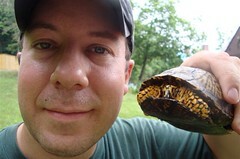 Congrats on your capture and banding. I like your account of the banding, and I just saw some of Jim P’s pictures as well. Looks like you guys have a grand ol’ time catching those owls. Wish I was home so I could join in. Awesome!!! On the one hand I’m insanely happy for you guys and on the other a little jealous ;D But I do get to relive it through the shots and blogs-so thank you, thank you, thank you! So kind of the owls to stop long enough to pose with you two! @ Adam – you have no idea! They are great for sure and one is enough to addict you with cuteness forever! @ Mary – You have no idea how exciting it was! Mary . . we were standing out in the freezing rain!! I do have some great photos for tomorrows post! @ Pam – thanks and was for sure! I can’t wait to return! @ Lisa – thanks and was wonderful for sure! @ Nick – I have not even seen Jim’s pictures yet! Was fun for sure and would have been great to see you! Wow!!! It was like I was there! Except I got to stay nice and warm looking at my computer. That was a great accounting of catching owls. The photos are so clear and sharp and your writing was terrific. Remarkable. To be so near an owl. It must be a thrill. Wow, what an exciting adventure! Another group of great pictures and a wonderful story to go along with them. Thanks for sharing Tom! Amazing that you not only saw them but got to see them so closely (and hold one). That would be such a thrill – congrats on the experience. I’m hoping to see my second SEO in the field this weekend (and maybe even get a picture this time around). Those owls are so gorgeous they look like stuffed animals! How cool of an experience was that? My kids love the pictures…. Thanks for sharing your adventure with all of us…. Wow, adrenaline for sure!! What cute things they are! Congratulations! How tremendously cool. I’m insanely jealous. @ Linda – so glad you enjoyed and wasn’t hard to be warmer than we were! LOL Thanks for your kind words! @ Barb – it was a thrill for sure! I know Jen is still excited! @ Sherri – thanks and I love my adventures! @ Marty – catching one was a great thrill for sure! Good luck and can’t wait to see your photos you capture! @ Jayne – you said it! It was such a great moment! @ Lana – was cool for sure and an honor to join the team! Congrats! I love those owls, they are my second favorite owl that enters PA! @ Nita – thanks and was fun to watch those songbirds go in to them! @ John – wish more were in our area! Very, very cool! What a great experience. Thanks so much for sharing it with us. beautiful shots!!! Those owls are just gorgeous!!! amazing work. Great work done by you and the other team members — and fun too from the sound of it. @ Lvn – thanks and before bed I needed to do a little blogging! @ Liz – thanks and I always enjoy sharing! @ Marvin – thanks and sure was fun! I probably should have included some of the video that I captured!